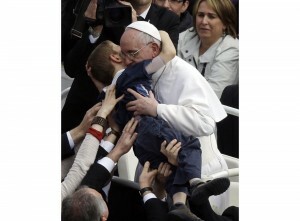 For a pontiff who is so big on emphasizing mercy, Pope Francis knows how to make me squirm. His witness for Christ turns the tables on my tendency to make my faith all about me. With a steady stream of up-ending spiritual remarks, the Holy Father has a way of capsizing my comfort zone. His shake-things-up style prompts me to reconsider everything I do as a Christian. As spiritual head of the Catholic Church, he wants me to understand the spirit of the law, not just the letter. He confronts me to not get comfortable in a prison of black and white thinking, but instead, be open to thinking in color. The unsettling message is this: the Christian life is supposed to be demanding, or it’s not worth much. And it’s not just what the pope says; he reinforces it with what he does. Just like Jesus did, the Holy Father will leave behind “little t” traditions, if they seem to no longer promote the kingdom of God. He explains the importance of discernment: “The wisdom of discernment redeems the necessary ambiguity of life and helps us find the most appropriate means, which do not always coincide with what looks great and strong.” He’s a WWJD (What would Jesus do?) man. The picture of him washing the feet of a Muslim woman prisoner perfectly captures one of his WWJD moments. Without moving or changing one iota of essential church teaching, the pontiff manages to reject Pharisaical evaluations of people, places, and things. Remarkable, this Holy Spirit-led papacy. The trouble is, the pope’s true message can’t be captured in a sound bite. Case in point, some secular media reporters who use cut-and-paste reporting have given people the impression that the pope thinks the Church should disregard its teachings on contraception, abortion, and gay marriage. Not happening.